Javier, 30, is from Estado de Mexico. After his most recent apprehension while trying to enter the United States extralegally, he was sent to Operation Streamline, a mass trial program that criminally prosecutes migrants arrested by the Border Patrol. The judge ordered that Javier be deported, gave him a 10-year bar to authorized re-entry, and threatened him with up to two years in detention if he returned to the United States without authorization. “I spent the last six years working as a waiter in St. Louis, Missouri, and I have a six-year-old and a three-year-old back there,” he explained during an interview. “The United States might be in danger from people from other countries or narcos (drug traffickers), but why is everything they do against us Mexicans?” he pleaded. When he was arrested, Javier witnessed a Border Patrol agent on horseback use his whip on a fellow migrant from his group. “¡Paranse pendejos!—get up, you idiots!” he yelled. Javier’s story is increasingly common. The increased danger and cost of crossing into the United States have led more and more people to put down roots once they arrive. This results in many, after “removal,” taking great risks to reunite with their loved ones. Thus, despite the seemingly endless tactics designed to make undocumented migration so horrible that people will not attempt another crossing, ties to family and to U.S. society are proving far more powerful than the deterrent effect of these measures. 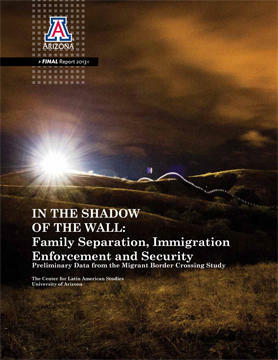 In light of this punitive approach to immigration enforcement, we want to highlight two largely neglected issues related to the current immigration reform debates taking place in Washington DC: the increase in family ties among deportees and the relatively weak deterrent effect of removal programs. Last week, along with our colleagues, we released a report based on surveys with 1,113 randomly selected, recently repatriated Mexican migrants in five border cities and in Mexico DF (the federal district). The surveys are the second wave in an ongoing project entitled the “Migrant Border Crossing Study” (MBCS), which began in 2007, but builds on years of previous experience on the border as residents and researchers. The goal of the study is to provide a much needed data source on the experiences of the nearly half a million people deported to Mexico each year. Our presence on the border has provided us an opportunity to witness a dramatic shift in border and immigration enforcement through efforts such as Operation Streamline, Secure Communities, 287(g), the Alien Transfer Exit Program (ATEP), and increasingly long and often inhumane detention as punishment for immigration violations. Stories like Javier’s give us a glimpse of the hardships experienced by undocumented migrants caught in the system and receiving severe new penalties for immigration violations. Our data allows for an understanding that goes beyond the legal repercussions of Operation Streamline, which reclassifies tens of thousands of deportees as criminal aliens every year. We can also see that it is designed to make matters physically difficult for migrants, with confusingly inadequate opportunities for legal counsel. After their arrest and after having spent an average of 2.3 days walking through the desert, migrants are shackled at the wrist, waist and ankles for a median of six hours. It is in this state that they appear before an immigration judge. In terms of legal counsel, only 1% of respondents mentioned that their lawyers checked if they had a legitimate claim to legal status, the first task of any immigration attorney. As Javier described, “They [the lawyers] just said, ‘¡renunciate!—give up!’ You can’t win.” Of the respondents processed through Operation Streamline, 40% reported that this was the only legal advice they received. People interviewed in Wave II of the MBCS are similar to migrants in decades past in terms of age, education, household income prior to crossing, and previous work experience. However, our data indicates a dramatic shift in people’s relationships to the United States over the brief period from 2008 to 2011. Data collected during Wave I of the MBCS in Nogales, Sonora (2007-2009), show that 15% of respondents indicated that their current home was in the United States and not Mexico. In Wave II (2009-2012), this percentage doubled to about 30%. Approximately three quarters of those surveyed in the second wave report having previously lived or worked in the United States compared to 63% of those in the first wave. Further, roughly half of our respondents report having at least one U.S. citizen family member and nearly one in four has a U.S. child under the age of 18, and just like Javier, they will not leave their children behind. Overall, we found that 70% of people who state their current home is located in the United States report they will cross again versus 49% of those who consider Mexico their home. This far outweighs any negative impacts of removal programs or the punitive effects of current immigration enforcement policies. Our study also explores the impacts of police collaboration with immigration authorities. We find that interior enforcement efforts such as Secure Communities and 287(g) disproportionately affect people with strong familial ties to the United States. Roughly 20% of people surveyed were deported as a result of an interior enforcement program like Secure Communities. Of those deported through this program, 31% have a U.S. citizen minor child compared to 20% of those apprehended through other means. People caught through this enforcement program also have more overall lived experience in the United States (an average of 8.6 years compared to 6.1 years) and report their current home to be in the United States at a much higher rate (46% versus 24%) than those not processed through Secure Communities. Unfortunately, conversations focused on whether or not these specific programs actually create more security have not traveled far in Washington. Current debates about immigration reform have centered squarely on a guest worker program and more border enforcement efforts. While a guest worker program may alleviate some of the flow of first time crossers, we found that only 17% of our respondents were new crossers. Regardless of the benefits of an increase in visas for low-skilled labor as it is frequently described, it is doubtful that someone like Javier would ever qualify. He now has a criminal record due to being processed through Operation Streamline. He also is a visa overstay risk because of his four prior apprehensions, not to mention his family ties in the United States. In order to fix this system we need to reunite families and unravel the legal changes to immigration enforcement that have focused on delivering criminal charges for unauthorized entry rather than the once standard administrative violations that do not carry criminal ramifications. Unfortunately for Javier and the millions like him in the United States without papers or marooned in a country they no longer call home, there is little relief in sight. Jeremy Slack (slackjeremy@gmail.com) is a doctoral candidate in the School of Geography and Development and a Research Associate at the Center for Latin American Studies at the University of Arizona. Daniel E. Martínez (mada0102@email.arizona.edu) recently successfully defended his dissertation in the School of Sociology at the University of Arizona and was hired as an Assistant Professor in the Department of Sociology at The George Washington University in Washington DC. His areas of research interest include immigration, criminology, and the sociology of race and ethnicity.